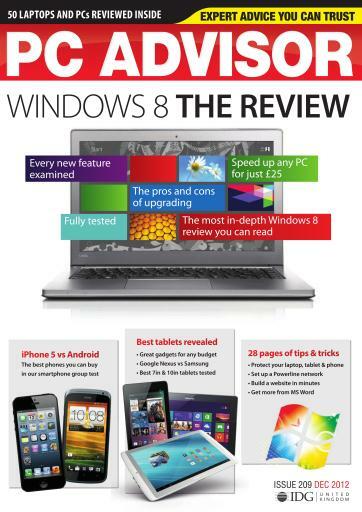 Get the latest issue of PC Advisor now for your regular dose of tech reviews, news, tips, tricks and opinion. We've got the only review of Windows 8 you need. Find out whether you should upgrade to Windows 8, learn about all the new features, how Windows 8 affects performance, and how you can speed up any PC for just £25. We've also got an in-depth review of the iPhone 5, plus an Android phone group test and a group test of all the very best 7in and 10in tablets you can buy. There are 50 laptops and PCs reviewed in this issue, as well as our usual top 100 tech products buyers guide, and 28 pages of tips and tricks.